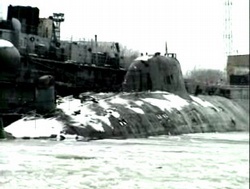 The press-service of the shipbuilding yard Sevmash based in Severodvinsk in Northern Russia continues to play down concerns caused by the November 2 fire that took place on the K-317 nuclear submarine while under repairs at the yard. Reckless negligence during welding works is blamed for the blaze that erupted on November 2 on the NATO-classification Akula nuclear submarine K-317. Several people are reported to have suffered carbon monoxide poisoning as a result of the fire. “We do not comment [where it concerns work] commissioned by the military,” said Sevmash press-service to Bellona.Ru. Nina Popravko, legal counsel with the St. Petersburg Environmental and Human Rights Centre Bellona, is adamant that such informational policy is unacceptable. “Such behaviour on the part of the yard’s representatives is simply foolish. The public must be given prompt access to information about any incident of this kind at a site as potentially dangerous as a nuclear submarine,” Popravko said. According to the Russian legislation, “excluded from categorising as state secret and from assigning the classified status is information on accidents… that threaten the health and safety of the population.” Presidential Decree No. 90 “On the roster of types of information categorised as state secret,” signed on February 11, 2006, and the Law No. 5485-1 of the Russian Federation of July 21, 1993, entitled “On state secret,” further specify that the classified status cannot be applied to information pertaining to the state of the environment, threats to the health of the population or violations of the rights and freedoms of the citizens. Contradictory reports on what happened on the K-317 and whether anyone has suffered from a fire are causing concerns that this simple legal truth may be lost in a seeming attempt to cover up the seriousness of the accident. In his statements to Regnum, acting head of the Special Department of the Federal Firefighting Service No. 18 Evgeny Morozov said that the submarine “suffered a smoke hazard caused by a short circuit in the electrical wiring,” but that “no fire outbreak or combustion products have been found.” He added that the crew had been able to tackle the situation without the help of a firefighting unit. The third compartment, where the short circuit had taken place, was then hermetically sealed as required by firefighting regulations. Mikhailov also cited a statement made by Severodvinsk Rescue Service head Konstantin Okulov, who said that one of the specialists on board did suffer from the incident: A worker was apparently hospitalised for carbon monoxide poisoning. This information contradicts firefighter Morozov’s statement about the absence of any combustion products. Other reports say that between four and seven workers altogether were taken to the hospital for treatment as a result of the accident. Sevmash press service declined to either confirm or deny this information. 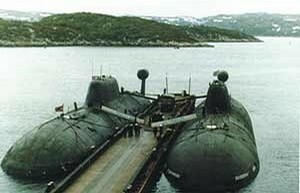 “Any suchlike situations on nuclear submarines, be it a fire or a smoke hazard, are accidents. They create a threat to the environment and to the safety of human lives,” said Nikitin.